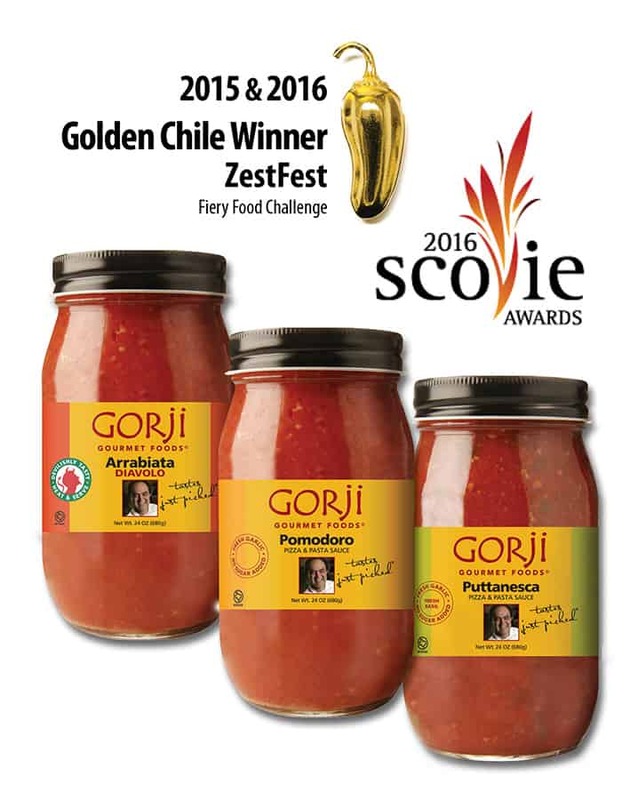 Two Time Golden Chile Award & Scovie Award winning Gorji Gourmet pasta sauces. DALLAS, Feb. 26, 2016 – Chef Gorji, chef/owner of Dallas’ Canary by Gorji restaurant and Gorji Gourmet Foods line of products for home cooks, has announced that his Gorji Gourmet Pasta Sauces, have again been awarded gold, silver and bronze in blind judging. The Arrabiata Diavolo won its second Golden Chile award at ZestFest’s Fiery Food Challenge, held January 29, 2016 at the Irving Convention Center. Professional judges at the spicy, zesty and flavorful food event taste hundreds of sauces, salsas and spicy treats from across the US and internationally to select the category winners. Arrabiata Diavolo won silver for Best New Product, as well as the Golden Chile at ZestFest 2015, with Pomodoro and Puttanesca taking home second and third places in the pasta sauce cook-off category in 2015 and 2016. The Puttanesca, also won silver in the 2016 Scovie Awards, another competitive blind taste-tested event. Chef Gorji developed the Gorji Gourmet Foods line from recipes he created and cooks with in his kitchen at Canary By Gorji, to help home cooks easily make gourmet tasting dishes without hours of preparation. The Pomodoro, with just three simple ingredients—tomatoes, garlic and imported olive oil— is clean tasting and vibrant, but not hot. It is a simple, flavorful base on pizzas, pastas and any recipe using tomato sauce. Use Puttanesca, with the addition of fresh basil, capers, kalamata olives and a touch of cayenne on any tomato sauce recipe calling for extra “zing”. The Arrabiata sauce is the spiciest with fresh garlic and basil, cayenne peppers and red pepper flakes. It adds zesty heat to pasta and pizza, as well as seafood, burgers and wherever the devil makes you do it! No Replies to "Gorji Gourmet Pasta Sauces Win Gold, Silver & Bronze Again"